What is Vajrahumkara Mudra? Typically translated as the Mudra of Unshakable Self Confidence. The first words that come to mind when looking at this beautiful Buddha gesture are: “I come with peace because I am peace”. It emanates a glowing river of the most beautiful golden energy – soft, kind, radiant, very healing, ever-lasting. I guess we can call it the gesture of confidence in the Self, the real Self that is one with Divine energy. Vajrahumkara Mudra also called “The Om Sound Gesture”. The wrists are crossed at the breast. The hands hold the Vajra (=thunderbolt, male) and Ghanta (= bell, female). The right hand crosses over the left at the wrist, palms facing inwards towards the chest and usually over the heart, symbolizing the union of method and wisdom. This is the gesture of Adi Buddha Vajradara, Samvara and Trailokyavijaya. When this confidence is there, the Heart becomes the strongest communicator. This is what this Buddha mudra evokes – strength and confidence in the Heart Self. 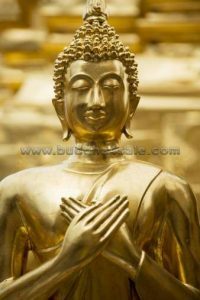 So where is the best FengShui placement for a Vajrapradama Mudra Buddha? hand gesture one can connect to the energy of deep peace and serenity. It is a powerful FengShui decor adapt to any places!